Friday Fictioneers – Choose the Right Door? This is my first entry for the Friday Fictioneers 100 Word Challenge set by Rochelle Wisoff-Fields. Please follow the link and read the other stories. Thanks. 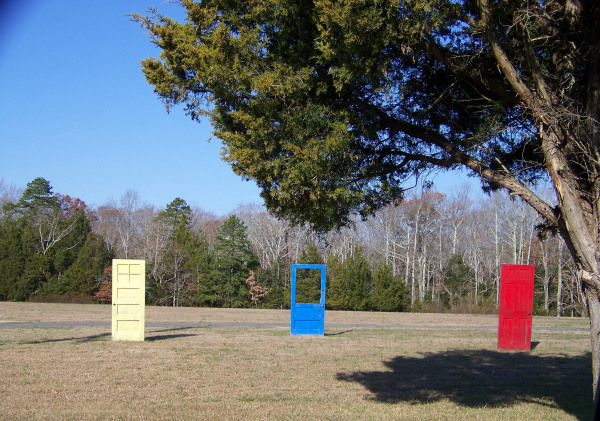 I’d come across the three doors in a nearby clearing. Instinctively, I knew where opening the first two would lead. The first, would take me to anywhere in the past I wanted to go. Just imagine it and I’d be there. Watch the pyramids being built? Hear The Sermon on the Mount? So many options! The second door would transport me to the future. To a date and time of my choosing. Both would return me, whenever I wished. You can’t leave us hanging there… 🙂 Nice one and welcome. Hi Doug! Thanks for your comment. Much appreciated. Hi Rochelle. Thanks for the warm welcome and the positive comment. Exactly! Let’s hope it won’t be a “D’oh!” moment, stepping through the red door. The first two lure you in with promises of great adventure, but its all just a setup to get you into the third door isn’t it? The adrenaline rush of being able to go anywhere and anywhen must be like a drug with the third door containing the promise of a more powerful fix. Eventually the third door will become irresistable. That’s exactly what I was trying to convey! No matter what’s on offer, it’s tempting to hold out for the promise of more! I really liked this. Really a good little story! Thanks for your comment, Linda. Glad you liked it. Excellent story, Steve. Well done. I wonder if you’re allowed to change things when you go back? Thanks. I like the idea that the Universe prevents us from changing the past. So if Time Travel is possible, you could end up going back to a parallel reality instead! As others have said, this was great. An excellent interpretation of this prompt!